This section is all about my own train layout – its conception, planning, building and operating. Since the newly expanded version of the layout is a work in progress, completion of this section of the website may take another year or two. Nevertheless, I thought some of you may wish to follow along as time goes on so you can see the challenges, problems and solutions that I have dealt with. Maybe it will help you as you build your own model railroad. My previous three train layouts have been learning experiences, but they have also been great fun. I think most people go through 2 or 3 model railroads in a lifetime for various reasons. Moving is probably the biggest motivation for starting a new layout. Sometimes it’s just the urge to build something bigger, better, or to try a different scale, different theme or different era. Each time you build or restore your empire, you will use the experiences that you have already learned to improve your modeling. You can therefore expect that your newer attempts at layout building will definitely become more realistic and more fulfilling with time. After having the learning experience of building 2 previous HO scale train layouts, I decided to start over with a small N scale 3x6’ layout (based on the Pocahontas Roads - a conglomeration of the C&O, B&O, Western Maryland, N&W and Clinchfield as they traveled through Pocahontas County in West Virginia). I called my freelanced version of this layout Pokie Roads just for fun. 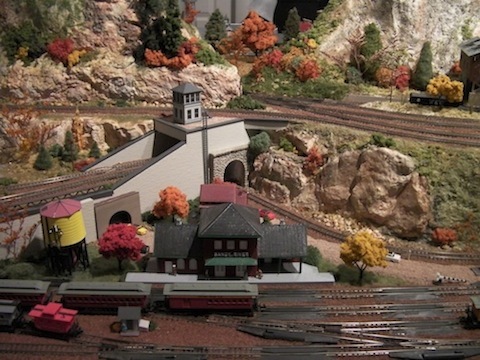 This new model railroad adventure took about 2 years of spare time to complete. (Admittedly, I didn’t have much spare time then.) Now I’m incorporating that into a much larger room-sized N scale train layout (19' x 16'), called the Blue Ridge and Southern, which will probably take another 1-2 years or longer to "complete" since it is a much larger project. By "complete", I mean at least presentable as a fully functioning, operating railroad with all or most of the scenery done, with perhaps only minor details remaining. As with most model railroads, however, we find ourselves constantly changing things to make them look better or operate better. And so, even when it’s "done", I’m sure the enjoyment will continue. I find that it’s helpful to break up the big projects into small projects that I can complete in about an hour or two. That way, it doesn’t seem like such an enormous task ahead when I go into the train room. This helps me to balance the train layout time with the rest of my life and also helps to keep it fun and challenging. This balance will be very important to achieve early on, especially if you have a family. In addition, if I’m not sure how I want to approach a certain project, it helps to walk away from it for a while, think about it, and then come back to it later. I get some of my best ideas for the BR&S when I’m not physically looking at it. Sometimes the parts that I need are not available locally, so I have to order things online and wait for their arrival before I can complete a project. That’s usually not a big problem since I can always find another project to work on while I’m waiting. Some items are expensive and I have to wait for the funds to become available before I can purchase them. However, over a period of 2-3 years, I can usually collect the amount that I need. Even if I were able to complete the layout in 2 weeks, I wouldn’t have the funds to do it in that short of time, so it’s actually good that it takes a while. I hope you enjoy the journey. I know I have. From "My Train Layout" to "HomePage"